By Kori ~ November 9th, 2009. If Miles had tasted either of these Washington Merlots, he never would have made his ridiculous comment about the varietal in the movie, Sideways. Washington State, in general, makes outstanding Merlot. Washington Merlot is known for its sweet cherry flavors and complex aromas and is generally higher in acidity than California Merlot. Recently, we had what turned out to be a Washington Merlot showdown in one of our double blind private tasting dinners featuring two wines from the 2005 vintage, the 2005 Fielding Hills Merlot and the 2005 Stephenson Cellars Merlot. For a more complete description of how we set up these private tastings, please refer to How We Taste. 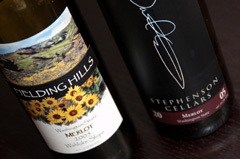 Fielding Hills Winery and Stephenson Cellars are two of our favorite Washington producers. They both make outstanding wines across the board from vintage to vintage. Fielding Hills Winery is a small, family-owned winery located in Wenatchee, Washington. Owner/winemaker Mike Wade and his wife Karen are longtime apple and cherry growers who have turned a middle portion of their orchard near Mattawa into a vineyard. Their Riverbend Vineyard, planted in 1998, is in the Wahluke Slope AVA. Stephenson Cellars, founded in 2001 by owner/winemaker Dave Stephenson, is a small winery located in Walla Walla, Washington. Dave Stephenson moved to Walla Walla in 1999 and began his career in the wine industry. Studying enology and viticulture textbooks and working at other wineries in Walla Walla prepared him to go out on his own with Stephenson Cellars just two short years later. In 2003, he began consulting for other wineries as well. Both of these wines are excellent and paired well with our lasagna dinner. We have tasted both of these wines on multiple occasions. It is always fun and quite interesting to revisit wines over time to see if and how they change. These two wines have consistently received high marks from us. In fact, the 2005 Fielding Hill Merlot won our last Washington Merlot tasting dinner in April. 2005 Fielding Hills Merlot (Wahluke Slope, Washington): Deep, dark purple with a very distinctive bouquet. Aromas of blackberry, black cherry, black plums, burnt toast, crÃ¨me brulee, and black pepper. Luscious black fruits, spice, black pepper, and licorice come through on the palate. Full-bodied with good acidity and medium to high tannins. Well-balanced and smooth with a very long finish. 2005 Stephenson Cellars Merlot (Washington State): Deep, dark red. Red and black fruits and some earthy aromas on the nose lead to flavors of black cherry syrup (but not too jammy) and Red Vines. Medium to full-bodied with medium tannins and a long finish.